National Trail’s Davlyn Werner allowed five hits and stuck out five batters in the Blazers 17-3 win over Miami East on Thursday, April 19. National Trail catcher Gracie Jones looks to complete a double play during the Blazers game with Miami East last week. Trail won 17-3 in 5-innings. 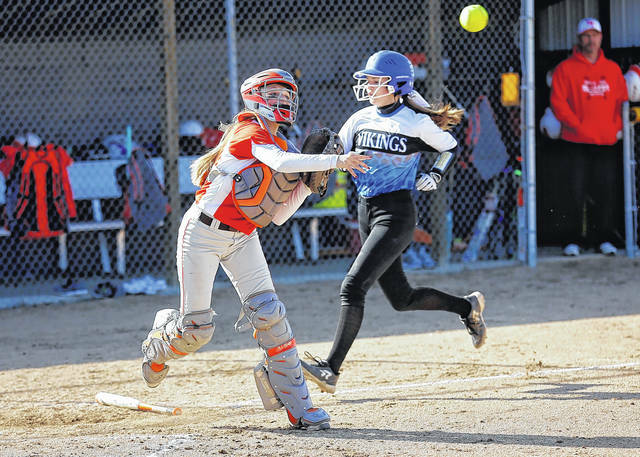 NEW PARIS — National Trail’s softball team picked up a win sandwiched in between a pair of losses last week. The Blazers beat Miami East, but suffered losses to Covington and Eaton to fall to 7-3 overall and 4-2 in the Cross County Conference. On Tuesday, April 17, the Blazers lost their second game of the season to Covington 8-5. The Blazers were led offensively by Lauren Sargeant, who was 2-for-3 with a double and 3 RBIs. Covington scored seven runs in the second inning. Trail scored twice in the second and three in the fourth. On Thursday, the Blazers improved their record to 7-2 for the season and 4-2 in the CCC with a 17-3 win over Miami East in 5 innings. Davlyn Werner picked up the win for Trail. “She keeps getting better with each game,” Trail coach Derek Lee said. Werner gave up five hits and had five strike outs. 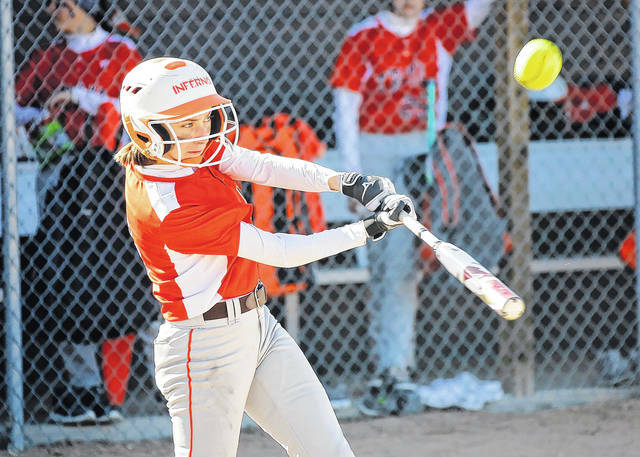 Offensively, the Blazers were led by Bobbi Jean Grimes who was 4-for-4 with a triple, a double and five RBIs. Ariel Lee went 2-for-3 with a double and two RBIs. Werner, Lauren Sargeant and Kayleigh Minner were all 2-for-3 with a combined seven runs scored. Trail scored two in the first, five in the second, two more in the third and eight in the fourth. The Blazers closed out the week with a 9-4 setback to Eaton on Saturday. Ariel Lee was 2-for-4 with two runs scored and Werner went 2-for-4 with two singles. 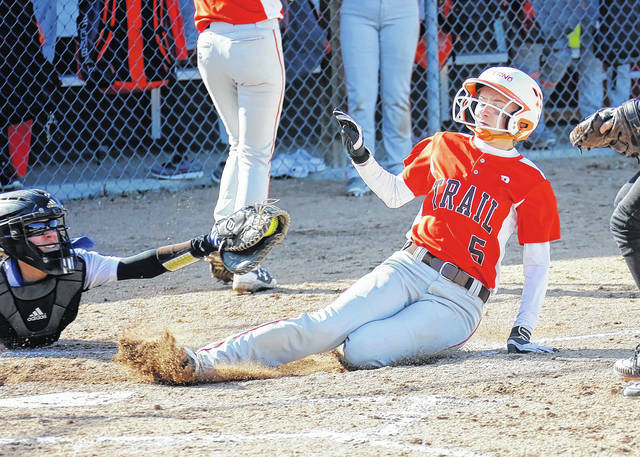 Trail was scheduled to play Tri-County North on Monday, April 23 and Middletown Madison on Tuesday. They are scheduled to host Mississinawa Valley on Friday and Bradford on Saturday. 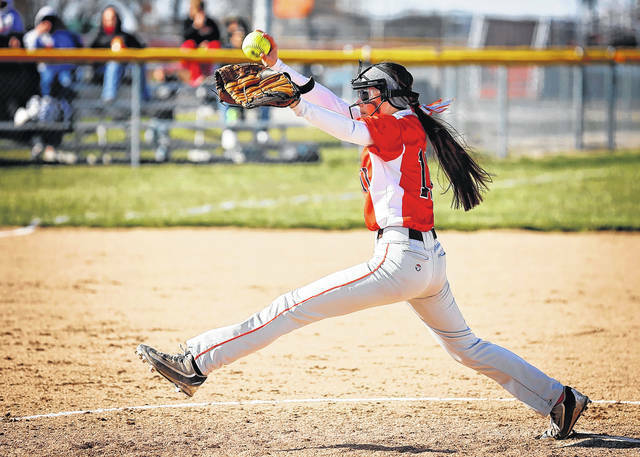 https://www.registerherald.com/wp-content/uploads/sites/41/2018/04/web1_NT-SB-1.jpgNational Trail’s Davlyn Werner allowed five hits and stuck out five batters in the Blazers 17-3 win over Miami East on Thursday, April 19.
https://www.registerherald.com/wp-content/uploads/sites/41/2018/04/web1_NT-SB-3.jpgNational Trail catcher Gracie Jones looks to complete a double play during the Blazers game with Miami East last week. Trail won 17-3 in 5-innings.